I perceive myself to be a self-aware conscious entity. I am aware that "I" exist. But within its own dimensions of existence, the conscious entity - that I perceive myself to be - appears to be completely blind. It has no direct means of sensing the existence of any other. There does not appear to be any universal field or fabric of consciousness that connects it with its fel­lows. I can't see directly into your mind. You can't see directly into mine. This self-aware conscious entity can sense, experience and respond to only what my physical brain presents to it. My brain can only present what it, in turn, receives from the senses of my body. My bodily senses can receive inputs only from the physical universe of space and time. Consequently, it is only via the physical uni­verse that I, as an individual human consciousness, can become aware of the ex­istence of others like me. The physical universe may, of course, include aspects and dimensions that my body is not equipped to sense. Nonetheless, I find myself to be an observer looking out into, what seems to be, a purely physical universe. Although our knowledge of it is, as yet, only partial, the physical universe appears to be founded upon 3 in­dependent dimensions of space within a dynamic of time. Space and time together uniquely have the fund­amental ability to separate events. No two events can occur in the same place at the same time. So, as I look out into the universe, what I see must be, by definition, events. From my point of view, therefore, the universe comprises events, which mix and flow in a dynamic continuum. Some of these events appear to be con­scious entities similar to what I perceive myself to be. I therefore deduce that I too must be an event. 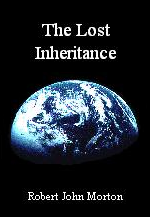 Consequently, the sum total of the events that each observer sees throughout his life is a separate unique history of the universe. He is able to see this history unfold only by looking outwards, in all directions, from the singularity at which his con­sciousness appears to be located, into an infinite sphere of space-time known as his past event-horizon. Theoretically, at the "other side" of this singularity, still within the realm of space and time, lies the observer's future event-horizon. This suggests that the observer himself must occupy an infinitely small space at this point. I find it difficult to imagine how all that is my conscious self could be contained within a point-singularity. This leads me to speculate that, as conscious entities, we must reside, in mutual isolation, in a further set of dimensions that are outside our scope of perception. The singularity must thus be the window through which we look into the universe that we know, and through which we become aware of each other. Although the universe be governed by what seem to be deterministic laws, complexities discovered within the fundamental nature of numbers creates, through the actions of these laws, events that are seemingly infinite in variety. Consequentially, every event is, to at least some degree, unique. Since every self-aware conscious entity be an observer, and since every observer be an event, this has the effect of bestowing upon everyone an inherently unique personality. A relationship is the essence of what takes place between two separate conscious entities. It too is made up of events. These events take place within what we per­ceive as the physical universe of space and time. However, the essence of the relationship itself is contained within two dynamic perceptual models. In a rel­ationship between you and me, the events that take place between us continually construct and update a perceptual model of you within my mind. Likewise, they con­tinually construct and update a perceptual model of me within your mind. 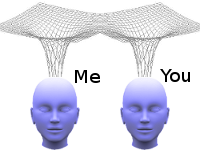 To be able to form and sustain a relationship, two conscious entities must be able to perceive each other's existence. To do this, they must both be immersed within the same communicative universe. The first essential for a society, therefore, is that each of its members must be able to perceive other members of that society. My perception of the world is necessarily from my point of view. It is as I directly see it from my unique position in space, time and the social order. It is my own private view of the world. It involves nobody else. It is the only view I can implicitly trust. There are three perceptual dimensions to this view: namely, seeing, experiencing and suffering. The first is the intellectual dimension. It requires that I be able to see the world from my own intellectual point of view. In other words, I must fulfil the role of a relativistic observer, looking outwards intellectually from my unique position in time, space and the social order. It comprises the knowledge I gain through passive observation, active investigation and discovery. The second is the emotional dimension. It requires that I be able to feel the world from my own emotional point of view. In other words, I must fulfil the role of a relativistic experiencer, feeling emotionally how the world affects me at my unique position in time, space and the social order. It comprises the good and bad feelings the world gives me, both through my passive presence and my active participation within it. The third is the spiritual dimension. It is how the world reacts to me and the good and evil that it forcibly imposes upon me. The first two dimensions of my direct view of the world are gained and compiled under the free volition and control of my conscious "self". "I" decide what I shall observe and in what I shall participate. And how I feel about it is invoked by my own mind. The third dimension, however, is outside my control. I have no choice about what society shall forcibly impose upon me. Observing others, it appears to me that practically all human beings possess, in full measure, all three of these perceptual dimensions or faculties. Notwithstanding, this direct view, with its three distinct dimensions, does not equip me to be able to form a relationship with another conscious human being. To be able to form a relationship with somebody, I need to be able to see the world also from that other person's point of view. In the following description, I have made my two participants a male and a female. Using the male and female pronouns makes it easier to write a clear explanation. 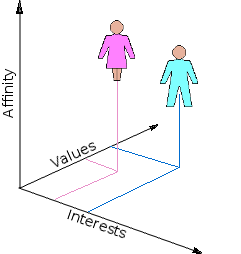 As illustrated in the diagram on the left, he must be able to see her view of the world the way she sees it, from her unique position in space, time and the social order. To be able to do this, he must possess, within his mind, an albeit limited simulation of her mental model of the world. Interestingly and importantly, since he is part of her world, his simulation of her mental model of the world must include her view of him. He needs to be able to see himself as she sees him. To be able to form a relationship with her, his indirect view of the world through her mind must be equipped with 6 further perceptual dimensions. from her intellectual point of view. In other words, he must fulfil the role of a remote - or indirect - relativistic observer, perceiving how the world must appear intellectually to her in terms of the knowledge she has gained through her passive observation, active investigation and discovery. from her emotional point of view. In other words, he must fulfil the role of an intellectual relativistic observer, perceiving the good and bad feelings the world gives her, both through her passive pre­sence and her active participation within it. from her spiritual point of view. In other words, he must fulfil the role of an intellectual relativistic observer, perceiving how the world reacts to her and the good and evil that it forcibly imposes upon her. The first faculty is well developed in many. It is particularly good for the exchange and understanding of academic ideas. The second and third faculties are developed in a much lesser proportion of the human popu­lation. These are of great value to the business or political strategist, the salesman and the gambler. However, the kinds of relationships such people have with their victims are hardly what one could call benign. from her emotional point of view. In other words, he must fulfil the role of a vicarious experiencer, sensing and sharing the good and bad feelings the world invokes within her, both through her passive presence and her active participation within it. from her spiritual point of view. In other words, he must fulfil the role of a vicarious experiencer of the way the world reacts to her and the good and evil that it forcibly imposes upon her. I think that most people have these dimensions to their perceptions but can only apply them to a very limited number of close family and friends. To be able to form a complete relationship with her he must finally also be able to empathize with her suffering. In other words, he must fulfil the role of a vicarious sufferer, genuinely suffering the way the world reacts to her and the good and evil that it forcibly imposes upon her. For this, he must have a selfless resolve to connect with her spiritually, his consci­ousness somehow becoming co-located with hers, suffering with her the oppression to which the world subjects her. Only a very small proportion of the human beings in this present world seem to me to possess an adequate measure of the inherent faculty needed to be able to do this. But even all this is not all that is necessary and sufficient for these two people to form a complete relationship. To facilitate a complete relationship, she must also be able to see, feel and suffer as completely from his point of view. Her mind must contain an equally complex simulation of his mental model of the world, which must include his view of her. She must also be able to see herself as he sees her. 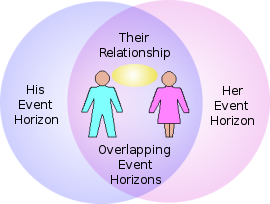 Although unique, each individual's past event-horizon overlaps, at least in part, with the past event-horizons of others. 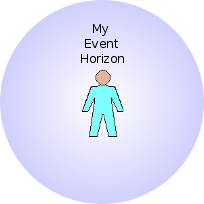 He is an event taking place within her past event-horizon. She is an event taking place within his. Thus, their two past event-horizons provide a duplex communications link between their consciousnesses. This link em­powers them to relate. The universe can thus be seen as a vast network of event-horizons through which each member of humanity could potentially relate with every other. His mental model of her world has to be suff­iciently detailed to enable him to perceive, ex­perience and suffer as if his consciousness were co-located with her consciousness as it looks outwards into her personal past event-horizon. Likewise, her mental model of his world has to be sufficiently detailed to enable her to perceive, experience and suffer as if her consciousness were located together with his consciousness as it looks outwards into his personal past event-horizon. For each to achieve this is not easy. In fact it is impossible. The consciousnesses of different individuals have no direct interconnection. They do not have access to each other through any kind of transparent conscious space. In this sense, indivi­dual consciousnesses are mutually isolated, having only limited indirect access to each other through the 5 human senses by way of the physical universe in which they are all immersed. Consequently, he can never look directly through her con­sciousness into her past event-horizon. She can never look directly through his consciousness into his past event-horizon. In the example above, the only means through which he can attempt to see from her conscious point of view comprises that part of his past event-horizon that co­incides with hers. Conversely, the only means through which she can attempt to see from his conscious point of view comprises that part of her past event-horizon that coincides with his. To gain an approximation to the other's point of view, each must apply an appropriate spatial, temporal, intellectual, emotional and spiritual trans­formation to his own conscious point of view. This is a tall order. It requires gar­gantuan effort. But it offers a supreme reward. It provides them with the facility to relate. But merely having the facilities to relate is not relating. For them to build and sus­tain a relationship they need a reason for doing so. He may be able to see, feel and suffer from her point of view as if he were her. She may be able to see, feel and suffer from his point of view as if she were him. But this is not enough. Each must care about the other as an independent conscious being. If she is suffering a lack in her needs of life, he must be moved by a strong inner conviction (or sense of duty) to take deliberate action to fulfil her lack. And vice versa. If he is suffering some kind of physical or psychological pain, she must be moved by a strong inner conviction (or sense of duty) to take deliberate action to alleviate his suffering and promote for him equal happiness and well-being. And vice versa. In all cases, the strong inner conviction must include a conviction to ensure that the actions taken to fulfil the lack of needs and alleviate the suffering of one person does not inflict collateral suffering upon anybody else. The strong inner conviction, sense of duty or motive in each is driven by an in­stinctive sense of right and wrong. This instinctive sense tells him that the lack in her needs of life is wrong. He perceives it as some kind of unacceptable imbalance in the way things should be. She should have her adequate needs of life. This same instinctive sense tells her that his suffering is wrong. He should not be suffering physical or psychological pain. This she perceives as an imbalance in the way things ought to be. These adverse situations may be perceived as perturbed states that society suffers when it has been forced away from its ideal state in which each has his adequate needs of life and is free from physical or psychological pain. Each must be motiv­ated by an inherent desire to expend the necessary effort to counter any such perturbation to bring the state of society back onto its ideal attractor. There is a mechanism within human consciousness. It is called conscience. It is this that emits the force of conviction or sense of duty to fulfil a lack or alleviate the suffering of another. 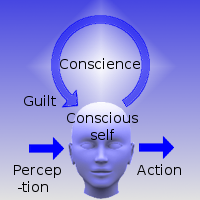 It is this that then amplifies this force to the threshold of guilt if action is not taken to fulfil that conviction. It is the mechanism that gives him the sense of obligation to behave towards her the way he would wish her to behave towards him. And vice versa. Through her perception, she translates her conscious point of view, as best she can, so that she can see, feel and suffer as he is seeing, feeling and suffering. She thereby suffers his pain. However, if she then does not act to try to alleviate his suffering, she suffers an even worse pain. It is called guilt. Her pain of guilt is pro­duced by her conscience. If she does not attempt to fulfil her conviction to alleviate his suffering, her con­science will super-regeneratively amplify her pain of guilt. However, if and when she starts to try to fulfil her conviction, her pain of guilt will instantly subside. Notwithstanding, even if he were to succeed in supplying the needs that she lacks and she were to succeed in alleviating all his suffering, they still would not have a complete relationship. Something further is required. It is rarely, if ever, possible for him to supply all the needs of life that she lacks or for her to alleviate his suffering completely. And vice versa. However, this im­probability opens the way to something far more valuable than each solving the other's problem. It facilitates the sharing of problems, pain, joys and pleasures. Sharing is the essence of relationship. There seems to be no continuum of human consciousness. Each instance of human consciousness exists in isolation. It has no direct connection to any other. Yet it has a powerful inward yearning or hunger to form relationships with other human con­sciousnesses. It suffers the pain of loneliness if it is unable to do so. Loneliness is thus like a vacuum within the consciousness that must be filled with relationships. This is the force that drives human consciousnesses to relate. It is thus the real or potential force of loneliness that creates within him the need to share her lacks that he cannot fulfil and that creates within her the need to share his pain that she can­not alleviate. The only force that can create and sustain a relationship able to assuage this loneliness is love. And the kind of relationship to which love gives rise is friendship. Love embodies a mode of conduct or behaviour that each must show towards the other. It requires that each work to establish, develop and preserve the other's personality, well-being and freedom. In so doing, each may advise the other but not dictate. He must not force upon her what he can clearly see she needs if it is not what she wants. If he, in good conscience, wishes to do something that she would rather he didn't, she must allow him the freedom and offer him her help to achieve it. And vice versa. Love cannot be formulated in law or enforced through a system of justice. It must come from an instinctive code that has been etched into the fabric of human conscience. Conscience tells him whether or not what he is proposing to do to or for her con­forms to the nature of love. Before actually doing what he proposes, he runs a mental scenario of doing it and then evaluates the outcome. If his conscience ap­proves it as a valid act of love, he can go ahead and do it. If his conscience flags it as being contrary to the tenets of love, then he will refrain from doing it. In other words, conscience is the instinctive sense of right and wrong that requests and requires that he must love her as he loves himself and that she must love him as she loves herself. The kind of relationship that love forms and sustains between two people is egali­tarian. It is a relationship of caring, sharing, freedom and openness for another in­dependent sentient being. It is friendship. Friends, do not possess or control each other. So friendship can never be exclusive. If two people are confined to relate only with each other then their relationship is incestuous and will quickly stagnate. Each, in reality, has the capacity or valency to relate with many others. He must therefore leave her free to relate with other friends. She must leave him free to relate with other friends. Love is all-inclusive. It cannot entertain exclusivity, jealousy or frust­ration. Love is often confused with lust. Lust is the negative counterpart of love. It is the force that most people enlist to try to alleviate their loneliness. But it creates a negative kind of relationship. And it doesn't assuage their loneliness. Lust is the desire to possess and control something or someone or whatever kind of gratification that something or someone can provide for the self. Jealousy is the frustration that results when lust is thwarted. In other words, when the person who is lusting doesn't get all his own way. Consequently, the kind of relationship that lust forms and sustains between two people is exploitive. It is a relationship in which one party dominates, subjugates, possesses and enslaves the other. Lust is the essence of what is generally known as Romantic love. The adjective "Romantic" ostensibly signifies "something pertaining to Rome". Its meaning and usage has a convoluted history. It is, however, generally associated with stories that involve a gentleman's lustful desire for a certain lady. This provokes him to court her in order to conquer her heart, thereby making her his exclusive possession whom he then effectively imprisons and controls. The framework, within which Romantic love plays out, seems to have an uncanny resemblance to the Roman law of Famulus. This formalises how a man has the right of exclusive ownership or posse­ssion of his goods and chattels, namely: his wife, concubines, children, slaves, animals, house and land. In other words, his famulus, from which comes the English word "family". As conscious beings each of us is physically constrained to look outwards from him­self always from a single unique point in space and time. This necessarily generates within us an ego-centric view of the universe. It starts with "me" at its very centre. The essence that is "me" is an intangible conscious observer that I call my "inner self". To this, my mind within my brain within my body merely constitute a host or vessel, through which my "inner self" is able to observe and influence the physical world. Hence, my mind - including my knowledge, wisdom and memories - is not "me" but it is exclusively "mine". Likewise, my brain is not "me" but it is exclusively "mine". Moving further from my "inner self", it follows that the body, which my brain senses and my mind controls, certainly is not "me". But it is still exclusively "mine". Thus, I may regard my mind, brain and body as being layers of my extended self, like layers of an onion. But how far out into the observable universe should the self extend - "me", my mind, my brain, my body, my possessions, my family, my home, my coterie, my community, my city, my nation, my country, my race, my species, my planet and ultimately, my universe? How many layers should the onion have? I think it reas­onable that I should have allodial possession and exclusive control as far out as my own body, although perhaps the State and its powers would not entirely agree. So far, all is perfectly reasonable. Through observation, I deduce that this is the same for all reasonable human beings. This is not lust, it is mere practicality. I may, with impunity, even extend this notion by adding another shell or layer, namely, my per­sonal effects like clothes, shoes and toiletries. However, this principle becomes lust when I cannot overcome an insatiable craving to apply it onwards and outwards to include possession and control of my family, home, coterie, community, city, nation, country, race, humanity, the Earth and ulti­mately, the whole universe. Lust is the craving force that drives a person to strive to possess and control other independent sentient beings and their means of turn­ing their labour into their needs of life. Lust may appear as love. For instance, I take action to protect and promote the well-being of another human being. But why am I doing this? Is it because I am protecting something that I regard as my possession - part of my extended self? If so, it is lust. I am merely protecting what is mine in order to maintain my posse­ssion, control and use of him, her or it. I am being totally egoistic. I am exhibiting love solely for my (extended) self. A classic example is the ambitious mother who wants her son to reach high aca­demic levels just so she can brag to the relatives about her offspring's achievement. She continually pressurises him to perform well at school to gain exemplary grades and prizes. But he is not naturally apt for passing exams. The pressure becomes unsupportable. He becomes stressed and depressed. He achieves very reasonable grades but in the process becomes withdrawn, socially repressed and may later develop emotional and mental problems. This mother does not love her son. She loves only herself. Her son is nothing more than a possession which she dominates - a tool which she ruthlessly uses to seek gratification of her lust for social recognition as a mother of a clever son. If she loved him, she would make herself aware of her son's natural abilities and use this knowledge to help and guide him along a path that suited his likes and talents. Friendship not only embraces the sharing of problems, pain, joys and pleasures, but also things. Friends do not normally share each others clothes. One person's clothes do not necessary fit another. Besides, a woman's clothes are generally inappro­priate for a man and vice versa. Nevertheless, they can share the use of furniture, appliances, books, homes, cars and other things that are useful to both. Such things, therefore, also help to facilitate their relationship. Just as friends do not possess or control each other, so too they do not exclusively possess or control the things they share. Friends cannot be exclusive to each other. Neither can their possession and control of things be exclusive. Friendship is a concept that is inclusive to all. Modern society's notions of exclusive membership, ownership and possession are alien to friendship. Friendship requires a concept that is wholly different from ownership and possession with regard to things. Each thing is shared such that it is used by each friend according to his need. One thus has a proportional share in the use of a thing according to one's need relative to the needs of those of one's friends who also share it. I imagine a friend's relative share in some­thing as follows. He is at the centre of a kind of per­sonal sphere of need. His relative share in something can then be represented by the inverse square of how far away it is from him within his sphere of need. In this view, one's sphere of need is analogous to the spherical electric force-field that surrounds a charged particle or the spherical gravitational field that surrounds a planet. The spheres of need, of friends who share something, overlap such that a shared object falls in the correct position within each of their spheres. The closeness of the thing to each friend is thus related to his proportional share in its use. This inclusive replacement for ownership and possession not only helps to facilitate friendship itself but also promotes a far more efficient economic use of resources. The kind of inter-personal interaction that dominates the world today is driven by the egoistic force of desire to possess and control other people and things. It en­genders master-slave relationships, which are exploitive. A master-slave relationship is materialistic and shallow. Friendship, on the other hand, is the unique form of inter-personal relationship that is driven by the force of love. It is all-inclusive. It has the potential to engender a world in which everybody is his neighbour's friend. A friend loves his neighbour as he loves himself. Friendship is thus a universal concept. A universal concept is nothing until it is applied in a practical way to specific in­dividuals. The limitations of the human frame, within its environment of space and time, impose a very low practical limit on the number of others with whom any given individual can interact. Within the context of the world as a whole, a person is perhaps only able to exchange passing salutations with a few members of humanity. Within his anthropological community, he is perhaps able to manage, on average, a few casual interactions per year. Within his personal coterie of close friends, he can interact much more frequently and intimately. The strength, depth, breadth and diversity of the bond of friendship thus varies en­ormously according to the specific participants in the relationship. That is, according to exactly who is relating with whom. I will now therefore make the male and fe­male participants in the relationship I am describing into specific individuals. I will call them John and Mary. John has the inherent conscious faculties to be able to see, feel and suffer from Mary's point of view. And vice versa. Mary is obliged by her conscience to try, by all means, to provide whatever John may be lacking and alleviate whatever he may be suffering. And vice versa. The impossibility of each to be able to achieve these ends facilitates the sharing of problems, pain, joys and pleasures. This engenders the love of friendship. Notwithstanding, for all this to take place at all, something else must bring these two people together in the first place. Something must cause each to notice the other. Something must draw each towards the other. Something must inspire each to in­teract with the other. In an exploitive society, people only co-operate in a common objective when they are pushed together by an external force such as a threat from a common enemy or from a fear of economic destitution. In an egalitarian society, the external forces are not there. Consequently people have to be induced to relate by forces that attract them to each other. I perceive of 3 such forces, which seem to act in­dependently of each other. In other words, they are separate forces that act per­pendicularly to each other in a kind of 3-dimensional semantic space. This is depicted on the right. 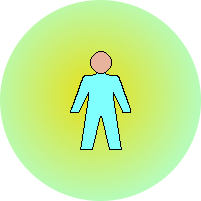 The position of the man within this 3-dimensional semantic space re­presents the relative proportions of sexual, intel­lectual and spiritual attraction that he has for the woman. Likewise, the spatial position of the wo­man represents the relative proportions of sexual, intellectual and spiritual attraction that she has for the man. To create the maximum potential for the development of a good relationship, the man and the woman must be not too far from and too near to each other. In this respect, I imagine a rela­tionship to be like a hydrogen atom. For it to exist, the electron and the proton must be kept not too far from each other but not too close either. 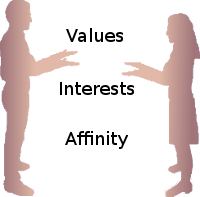 Thus the distance, in this 3-dimensional semantic space, between the man and the woman must be small enough for them to share a common context within which they can communicate, yet large enough so that each has some content to com­municate to the other that the other does not already know or have. The force that initiates the attraction between two people I have called affinity. 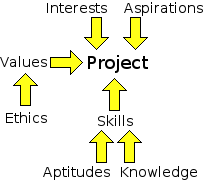 It is shown as acting along the vertical axis in the dia­gram. It seems to be invoked by the physical appearance of the attr­acting person in the eyes of the one attracted. I think it also involves the attracting person's disposition and attitude towards the attracted person as expressed through facial expression and body language. I have heard some people refer to it as personal chemistry, with others thinking that it also involves the attracted person detecting some kind of smell from the attracting person subconsciously. At its most int­ense, this force of affinity manifests itself as sexual attraction, which is - in general - vastly greater between people of opposite gender. Affinity seems to be naturally strong with parents and siblings. Perhaps this is gen­etic, although it could simply be due to long-term proximity. Affinity between siblings can be immense. But it can also evaporate rapidly when they go their separate ways in later life. Even with parents, affinity can be fragile. A parent can be physi­cally present in the same house as a son or daughter but not really be connected. Affinity between school friends can be strong and can even become obsessive, then rapidly fade like a desert flower. In adolescence and adulthood, affinity super-charged by sexual attraction can become overwhelming only to burn out with the uncanny rapidity of a grass fire. The attractive force of affinity is not, however, rest­ricted to members of one's family and formative community. On occasions, indiv­iduals of different races and cultures can be irresistibly attracted by this force. The attractive force of affinity is like a rocket-assisted take-off: if there are no eng­ines to take over when the rocket burns out the relationship will collapse. To sustain a relationship, there has to be another dimension. The participants in a relationship need to have shared interests. I had two school friends with whom I shared an interest in amateur radio. We used to discuss the theory and practice or radio for hours. All through our school years we exchanged ideas. We designed and built receivers, transmitters, test instruments. We took trips to try to make radio contact with people from unusual places. In parallel with these "radio" friends, I had two other significant friends. One was a boy with whom I had long discussions in the playground about life, the universe and everything. The content of our discussions seemed to inhabit a bottomless pit. The other friend was a lover of philosophy and classics. It would, at first sight, seem strange that we should be such good friends since I was in separate classes in the sciences. But we discussed both subjects as a universality, as if we were a pair of Renaissance thinkers who lived before the learned academies had decided to cat­egorise and separate subjects into classics and sciences. At college I remember 4 particular friends. Two were hard-line Communists, one was a conservative Christian and the other was a Lutheran. Our common interest was exploring and comparing our rather disparate belief-systems. We were frequ­ently together discussing and debating issues from points of view that were poles apart. But we had an immense affinity for each other. We always felt good in each other's company. Our different stances provided vast amounts of content for us to exchange with each other. Although it may not always have appeared so on the surface, all my friends and I had very similar personalities, general behaviour and social protocols. Although our respective families did not necessarily share the same level of income or parental profession, they did seem to exude similar ideas about general human concern. We also had very similar levels of personal aspiration, albeit in widely differing direc­tions. Despite the very concrete interests that I shared with these various friends, all our relationships faded as soon as we separated at the end of school and college. I made several attempts to reconnect with some of them. But our old affinities and shared interests were not strong enough to overcome the severing force of changed circumstances and occupations. To make a relationship complete and last­ing, yet another dimension is required. A burning mutual affinity and passionate shared interests alone cannot sustain a relationship. For a relationship to survive and to flourish, its participants must act in harmony. To do this, they must live according to the same values. Firstly, each must exhibit towards the other all the basic virtues. John must show concern that Mary gets her due benefit from any activity in which they cooperate. And vice versa. Mary must show willingness to allow John to lead a life based on a certain set of beliefs that may be contrary to hers. And vice versa. John must always tell Mary what he believes to be the truth about whatever she asks. And vice versa. Mary must always adhere to the mutually agreed rules of their relationship. And vice versa. John must control any feeling of anger towards Mary that may arise from time to time. And vice versa. Mary must willingly forgive John when he is sorry for offending or neglecting her. And vice versa. John must act with respect towards Mary in a way that demonstrates her worth and preciousness as a human being. And vice versa. Mary must stand up for John against external threats, even in the face of danger to herself. And vice versa. However, a pair of individuals may well exhibit all these virtues yet still be unable to function as part of an egalitarian society. Secondly, therefore, they must also both subscribe to the same appropriate ethical world-view. Let us suppose that John believes that each should give as he is able and receive according to his needs, while Mary believes that each should only receive according to his merit. Their goals will be incompatible. Their actions will clash. Their relation­ship will break. To be able to form a relationship that can be part of an egalitarian society, the virtues themselves are necessary but not sufficient. What is also of concern is the scope within which these virtues are applied and practised. In today's exploitive society, people apply these virtues in a selective way. They act very virtuously towards their partners, friends, children, people of high social standing and influence and to their extended family, while showing little or no virtue towards people who "don't matter so much". The degree to which one person ex­hibits virtue to another person thus varies inversely as the social distance of that other person. In a future egalitarian society, a person will be bound, by his spiritually-evolved con­science, to exhibit all these virtues equally to everybody. Notwithstanding, this does not mean that one's relationships, with all persons with whom one has contact, are of equal strength. I strongly perceive that there is a limit to the number of people I can know during any given period of my life. I consider this number of people as forming a group that I call my anthropological community. These are people I know to varying degrees. I at least know who each member is and where he fits into my community. As such, I know how much I can or cannot trust him. I think it reasonable to extra­polate that other people also each have a uniquely identifiable anthropological com­munity. In an ancient agrarian society, a person's anthropological community probably comprised a close-knit group of people, who lived in close proximity to each other, where everybody knew everybody else. Each had a communal relationship with each of the others. However, being an inhabitant of today's city-based world, a large proportion of the members of my anthropological community probably don't know each other. My anthropological community will therefore probably have the form of a network comprising irregular clusters of communal relationships. Further­more, my anthropological community can - and indeed does - span international, racial and cultural divides. And I find that this enhances the quality and diversity of my anthropological community. Psychologically, people who are not members of my anthropological community are just generic humans. They are generally not individuals I can place in relation to any others. They are just part of humanity. I do not class a communal relationship as intimate friendship. I do not necessarily have any personal affinity with a member of my anthropological community. I do not necessarily share any specific interests or values with him. Nonetheless, it is from among members of my anthropological community that my friends emerge. John and Mary are each part of their respective anthro­pological communities. They encounter and become mutually attracted by a strong personal affinity each has for the other. They converse at length over many months. They enjoy each other's company. They dis­cover that they share many deep interests and sub­scribe to the same strongly-held moral principles. They find themselves naturally and subconsciously behaving towards each other in an ultra-considerate and resp­ectable way. They start to become intimate friends. Their relationship intensifies to the point where it crosses the threshold at which emotional imprinting starts to occur. A complex emotional model of each starts to form in the other's mind. At this point, the individual - who he is to her and who she is to him - starts to matter. The relationship between them has become highly sel­ective. As time passes, they go through a process of adaptive attachment. Her emotions, interests and values become augmented and more oriented towards his. His emotions, interests and values become augmented and more oriented towards hers. All this has the effect of building an ever-stronger and wider communications link or bridge between their two conscious selves. It also places within each of them a sense of obligation to - and responsibility towards - the other. But this is not enough to construct a robust lasting relationship. To do this they must start to deploy their shared affinity, interests and values within a shared life-project, the fulfilling of which the two of them will share as a life-long goal. This goal may include many practical projects along the way. But its overall essence is the continual betterment of their relationship with an element of contributing to the making of a better world. Their shared interests, directed by their shared values, give rise to shared aspirations, which in turn determine the shape and form of their joint life-project. However, because they are separate human consciousnesses, especially since they are of opposite gender, their per­ceptions, knowledge and aptitudes are comple­mentary, overlapping to at least some extent. This shared project keeps the relationship between them broad and dyna­mic, and thereby extremely robust. It would be extr­emely difficult for any outside force to break. This is the bond of intimate friendship. And the bond of intimate friendship is life-long love. At this level, loss (or disconnection) of the relationship would cause suff­ering, anguish and pain. Physical or geographic separation, however, would not. The bond of intimate friendship is "love if you stay and love if you leave". She does not want to imprison him as a possession. She wants for him what is best for him, what­ever he may do or wherever he may go during his life. And vice versa. The bond of intimate friendship, as I have here described, applies equally to rela­tionships between individuals of the same gender or of different gender. Notwith­standing, the complementary emotional, perceptual and physiological differences between individuals of opposite gender, all other things being equal, provides them with the potential to forge far closer and more intense inter-personal bonds. From my observations of life, human society can have one of only two possible forms. It can only be either exploitive or egalitarian. The society of today's world is driven by lust. The relationships between its members are therefore exploitive. It is the principle on which business is based, from which practically all other social relationships follow. However, if each were to heed and obey his conscience, all human relationships would be conducted according to the rules of love. All human beings would be friends. This would make each of us a node within a global network, in which each link would be an intimate friendship. Such a society would need no bureaucratic hierarchy imposing and enforc­ing a written law upon it. Its laws would be naturally inst­inctive to each of its citizens. Applied by love and enforced by conscience, they would regulate each friendship in a benign and productive way. Thus would be formed an unlimited network of relationships in which each would be nourished and augmented by his neighbours. Such a global network of intimate friendships would form a perfect egalitarian society. Its structure and character would enable it to provide an ideal conduit for culture, trade, wisdom and know­ledge. Under such a social structure, humanity could live happily. Unfortunately, such a society cannot be built without determined conscious effort on the part of each participant. The natural force that drives the human mind is lust. Consequently it is always an exploitive society that emerges naturally among human beings. It requires unilateral conscious determination on the part of all to create the network of friendships needed to form and sustain an egalitarian society.